"MrTruck TV, video of truck reviews, horse trailer reviews, accessory reviews, RFD TV,Equestrian Nation TV, Horse Trailer Towing Accessory and Truck Accessory Video Reviews, SEMA accessory video review, Saddlematic, Cushion EZ Clean trailer floor, Bale Bucker, Hay Rack,Ford truck review, Toyota truck review video, horse trailer reviews, horse trailer articles, trailer reviews, accessory install articles, Cimarron TV review, Logan Coach TV review." PickupTrucks.com 2015 Light Duty Challenge behind the scenes with Logan Coach and more. MrTruck behind the scenes with the largest truck comparison by http://www.PickupTrucks.com . We had a dozen 1/2 ton trucks climbing mountains, racing on a track, towing trailers, testing at Davis Dam towing Logan Coach trailers from Imperial Trailers in Mesa AZ. 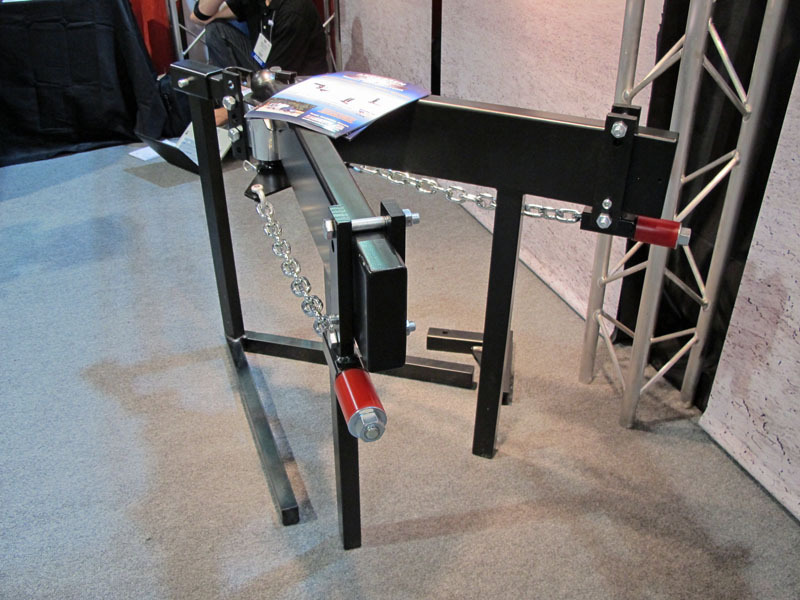 We used Weigh-Safe aluminum adjustable receiver hitch that weighed our trailer tongue weight. Also Intelli-Hitch adjustable receiver hitch that doubled as an electronic surge trailer brake controller built into the hitch. www.LoadTrail.com from www.JayHawkTrailers.com provided us the car trailer I hauled the water totes to Arizona to use as weight in the Logan trailers. Auto Flex fromwww.LBCTrailers.com has a complete pickup truck leaf spring replacement with an air suspension. It bolts on the same place as the factory leaf springs. Self levels, improves ride, braking, steering and handling. Comes with compressor, tank and dump valve and tap for using on board air for you tires etc. Also a complete trailer air suspension. www.EzConnector.com interview at SEMA 2011, waterproof trailer connection, oil rings and cord keep the dirt and water out, earth magnetic holds the connection together tight. TeleSwivel telescoping and swiveling drawbar hitch to connect to your trailer when you can only get close. New all Ford Complex diesel engine, new 6-speed automatic transmission. Turbo lag is gone and dramatic improvement in fuel mileage. The best ladder you'll see on a trailer. Climb up barn ladder style or pull it out and have a easy climbing staircase. It will attach to the side of your trailer or to the rear door. It's all aluminum, light and attaches well in a spring loaded bottom bracket. Click to watch NEW Saddlematic Video model is 5'2", now saddles are easily within her reach. 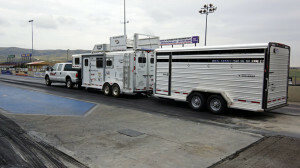 Updates from each event, pictures & commentary, MrTruck.com Presents:"EZ Connector Horse Expo Tour," With the latest trailer safety and technology accessories on exhibit on tour, come by and watch demonstrations We'll be displaying some helpful technology for safe towing. Stop by, see our display and ask questions.Click for the "Tour" schedule,see when we'll be in your state.